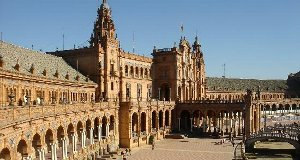 Seville is the artistic, historic, cultural, and financial capital of southern Spain. 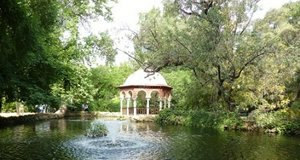 It is situated on the plain of the Guadalquivir River, with an average elevation of 7 metres (23 ft) above sea level. 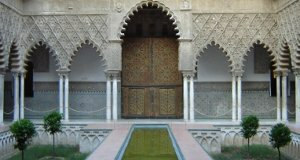 Seville has a rich Moorish heritage, and used to be a prosperous port that carried out trade with the Americas. 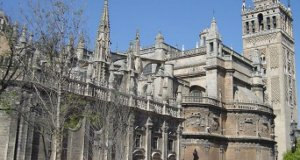 The Cathedral of Saint Mary of the See (or Seville Cathedral), is a Roman Catholic cathedral. It is the largest Gothic cathedral and the third-largest church in the world. It stands on the site of the Great Mosque of the 12th century. Today, the only part which remains of this structure is the minaret, also known as the Giralda due to the weather vane added to the top in the 16th century. 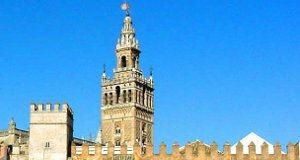 The Giralda is a former minaret of the Arab mosque, that was converted to a bell tower for the Cathedral of Seville. The tower is 104.5 m (343 ft) in height. The part decorated with bricks is the work of the architect Alí de Gómara. A series of ramps takes visitors up to the bell tower, which offers outstanding views over the city. The Plaza de España is a square located in the Maria Luisa Park. It was built for the Ibero-American Exposition of 1929. The Plaza de España complex is a huge half-circle with buildings continually running around the edge accessible over the moat by numerous beautiful bridges. In the centre is a large fountain. By the walls of the Plaza are many tiled alcoves, each representing a different province of Spain. This square is surrounded by three palaces in different architectural styles that were built for the Ibero-American Exposition of 1929. The first, in the Neo-gothic style, is the Royal Pavilion. The second, Neomudejar, houses the Museum of Popular Arts and Customs. And the last, Neo-renaissance, is the Provincial Archaeological Museum. The Alcázar of Seville is a royal palace, originally a Moorish fort. The Almohades were the first to build a palace, which was called Al-Muwarak, on the site of the modern day Alcázar. 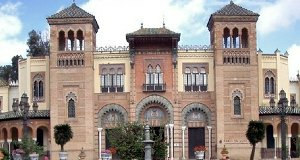 It is one of the best remaining examples of mudéjar architecture. Subsequent monarchs have added their own additions to the Alcázar. The María Luisa park is a "Moorish paradisical style" with a half mile of: tiled fountains, pavilions, walls, ponds, benches, and exhedras; lush plantings of palms, orange trees, Mediterranean pines, and stylized flower beds. 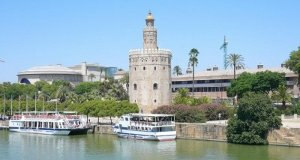 The Torre del Oro (Gold Tower) is a dodecagonal military watchtower, built by the Berbers during the Almohad dynasty (first third of the 13th century) in order to control access to Seville via the Guadalquivir river. The tower served as a prison during the Middle Ages and as a secure enclosure for the protection of precious metals periodically brought by the fleet of the Indies (possible origin for the tower's name). 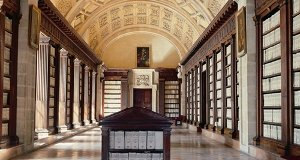 The General Archive of the Indies, which used to be the Mercaderes Market, was built in 1572. Designed by Juan de Herrera. Now, It is the document repository of extremely valuable archival documents illustrating the history of the Spanish Empire in the Americas and the Philippines. The building and its contents were registered in 1987 by UNESCO as a World Heritage Site.